The impressive Oki C810cdtn may be small but it can handle media as large as an A3. It has a maximum resolution of 1,200 x 600 dpi and delivers vibrant coloured and solid black output. The Oki C810cdtn laser printer is intended for small workgroups and offices. It has built-in networking connectivity and offers a monthly duty cycle of 75,000 pages. The C810cdtn printer has a standard memory of 128 MB and has a 200 MHz processor. Print speed needs a boost. The Oki C810cdtn duplex network printer with 2nd tray and cabinet has a total paper handling capacity of 1,360 sheets. It has a small control panel with an LCD display and function buttons. 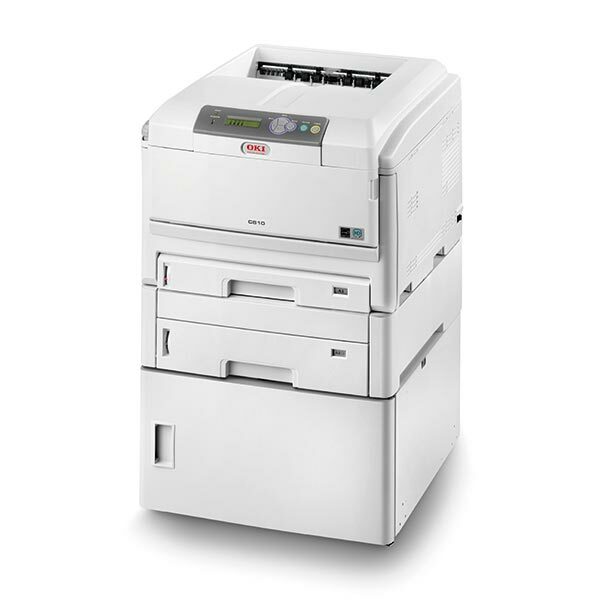 The Oki C810cdtn A3 colour laser printer delivers output with a speed of 32 ppm for monochrome and 30 ppm for coloured. For connectivity, an Ethernet port is located on the back of this device. The four separate Oki C810cdtn toner cartridges can print approximately 8,000 pages per colour. Despite its small size, this versatile unit can handle different types of media including A3 and even banners. The Oki C810cdtn printer delivers high-quality output and delivers them at reasonable speed. It can be easily shared by workgroups as it has Ethernet. The network-ready Oki C810cdtn colour printer has high-paper handling capacity. It also has a duplexer that can significantly reduce paper waste in offices. Though print speed is reasonable, the Oki C810cdtn colour LED printer may not be sufficient for large or busier work environments. This laser printer could be better with the addition of a front panel USB port for direct printing from thumb drives.